Fix and Recover Corrupted, Damaged or Inaccessible InDesign INDD Files In Minutes!!! Summary – Are you not able to access your INDD files? Is your Adobe InDesign INDD files got corrupted and you are not able to open it? 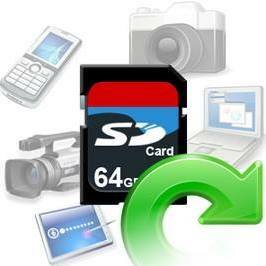 Are you looking for an easy solution to repair and restore corrupted or damaged .indd files? If “yes” then you have landed on the right webpage. In this article you will learn about InDesign recovery that will help you to fix corrupt InDesign files. Easily repair and recover inaccessible, corrupted or damaged InDesign Files. Fix all Adobe InDesign Elements in the INDD file. 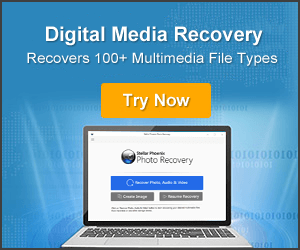 Easily perform Raw Recovery to repair images and text of corrupt InDesign file. Preview repaired and recoverable INDD files within the software before you proceed further to save them on your Mac system. Support Adobe InDesign CS6, CS5, Creative Cloud. Work on all Mac OS version like Sierra 10.12, 10.11, 10.10, 10.9, 10.8, 10.7 & 10.6. Some users have seen posting in forums about the misbehaving INDD files. Sometimes the bad file will open but crashes every time, or the file crashes while saving. Sometime the file may get corrupted while opening. So if you are not having the valid backup then what will you do? The INDD is an Adobe InDesign Document, developed by Adobe Systems. This file format includes page formatting information, linked files, styles page content and also used for creating and formatting books and magazines, newspapers, flyers, brochures and many more. So, what if the file gets damaged – Is it the end of all your hard work? An INDD file can get damaged if an error or some other unexpected behavior happens at the time you are working in that document. InDesign file wont open / Corrupt? I have been working on a catalogue for a while now, my indesign file was getting to around 300 MB – I’d backed this file up recently on an external hard drive which melted and died, more importantly I cannot open the master file on my PC which is the only file I now have. I will open the file in indesign and I notice on PC it will just freeze and show a loading ring where the mouse should be but I left this going for 5 hours and nothing, I manually quit out of indesign and then open and it then tries to recover that file, but also gets stuck at a certain point. On a Mac there is a progression bar at least but this gets around 80% and then gets stuck every time. I’m guessing this files corrupt in some way or that a small part of it is stopping me from opening it properly. 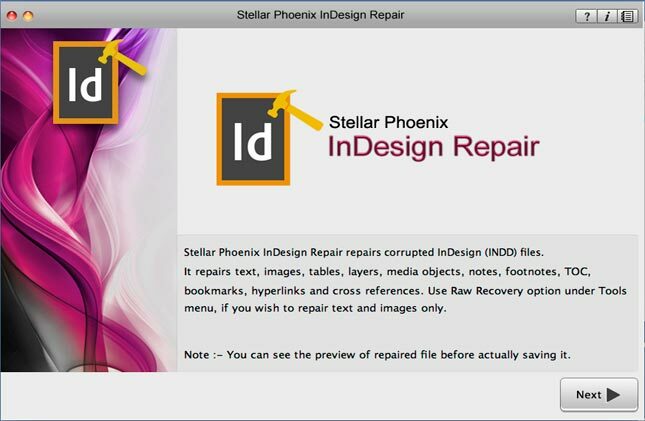 This is a project which is due in soon and I’ve literally not got any work to show :S I’ve tried Stellar Phoenix indesign repair which has just been running for about 4 hours doing nothing but make my mac get really hot and am now totally out of options, can any one help moi?? That was just one example. Similarly, there are several users out there who are dealing with such type of problem with their .indd document files. However, the good news is that there are few solutions available that you can follow to repair corrupt indesign file and can easily be recovered. The corrupted INDD files can be recovered by taking help of the third party recovery tool that accurate recovery of damaged/corrupted InDesign files. The files can get corrupted due to various reasons. By knowing the reasons of corruption you can reduce the chances for damages and corruption in future. There are various reasons that may corrupt or damage the INDD files. Some of them are given below. Due to virus/malware attacks that infect the hard drive and it corrupt the saved files. By sharing data on the virus infected system. By downloading infected files like free downloaded programs, software. Due to sudden power cut. Accidentally system shutdown or crashes may corrupt the files. Due to corruption of system files. Due to some error the files may get corrupted or become inaccessible. By taking some appropriate steps you can prevent corruption or damages like by installing good antivirus in your system, and also by avoiding downloading free software, games etc. This will gradually help you to reduce the chances of corruption of InDesign document file. 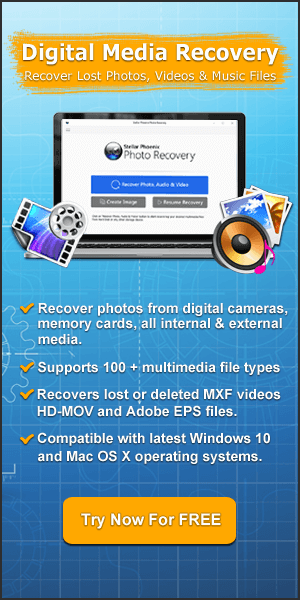 How to Repair & Recover Corrupted or Damaged INDD files? Make sure that your general OS runs well. You can also try restarting (or starting up) InDesign with the cmd+alt+ctrl+shift keys held down. 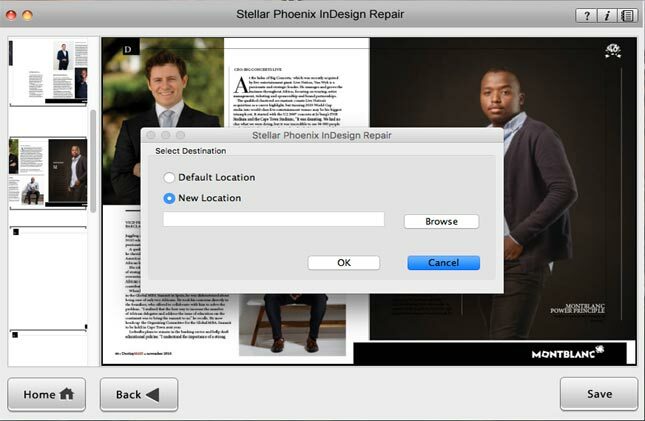 Or else you can make use of the efficient InDesign File Repair for Mac. 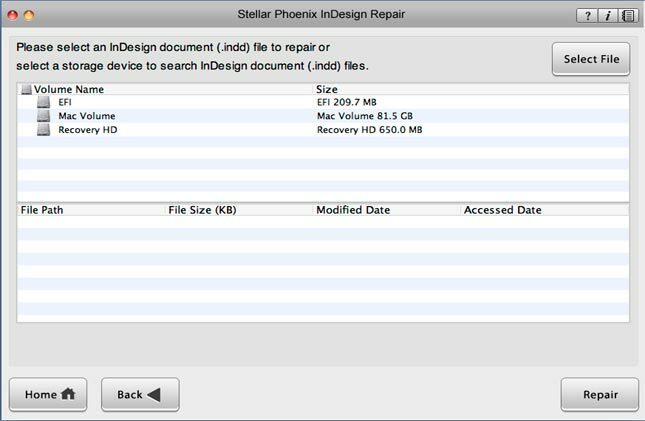 The Stellar Phoenix InDesign Repair Tool is the best software designed to repair, damaged, corrupted or inaccessible INDD files and recover InDesign INDD files. 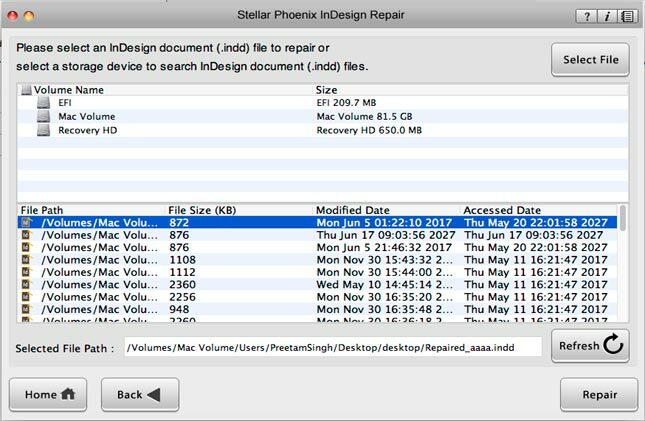 Stellar Phoenix InDesign Repair is absolutely advanced tool that can effectively perform InDesign file repair, regardless of the causes that makes INDD documents damaged or corrupted. So make use of InDesign Repair Tool by downloading it and following easy steps. Step 1 – Download and Install INDD File Repair on your Mac- you will see the main page as it shown in the image below. Click on “Next” button to proceed further. Step 2 – After this click on “Select File” button to simply browse and select the corrupt InDesign INDD file stored within your Mac System. Step 3 – You can also click on desired hard drive to check for all INDD files. After the files are listed, you can then select the INDD file that is corrupt or damaged and then click on “Repair” button. 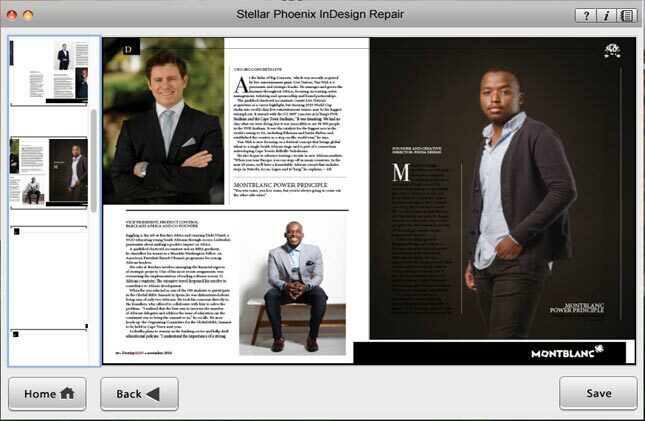 Step 4 – Once the repairing process gets complete, the tool will open up the repaired file with Adobe InDesign, only to show you the preview of the file. Step 5 – In order to save repaired INDD file, you have purchase the fulle version of the software. However, if you have already purchased full version of INDD file Repair tool, then simply click on “Save” button and select any desired location on your Mac to save them. That’s All! I hope you will be able to repair the corruption of Adobe InDesign documents and easily recover them on your Mac system with the help of InDesign file repair software. The INDD is an Adobe InDesign Document, developed by Adobe Systems. It is used for editing newspaper, magazine, books etc. So if the files get corrupted then this article proves helpful to you..